Now that I have a functioning loaner computer, its time to get serious about a build log! 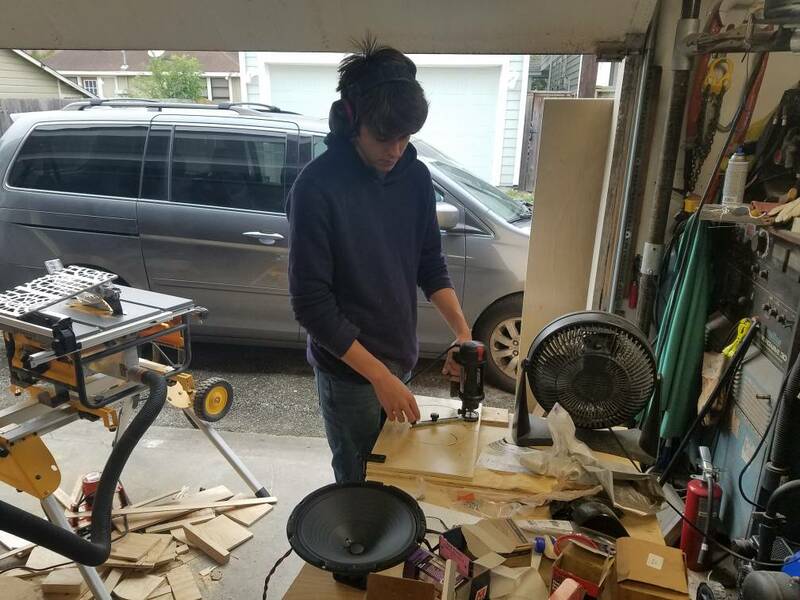 My son and I are building a vacuum tube guitar amplifier. I've built semiconductor amplifiers, but always had some interest in vacuum tubes (and my dad built some when he was a kid). The whole guitar "I WANT distortion" is kind of weird for me too. But, its shop time for me and Carl! After some layout work, we had a full size amp box and started thinking about where the guts go. Nothing like full scale to get a feel for something! FYI, the CANARY cardboard shears from Amazon are OMG great! Based on the cardboard, I figured out what the enclosure needed to look like. 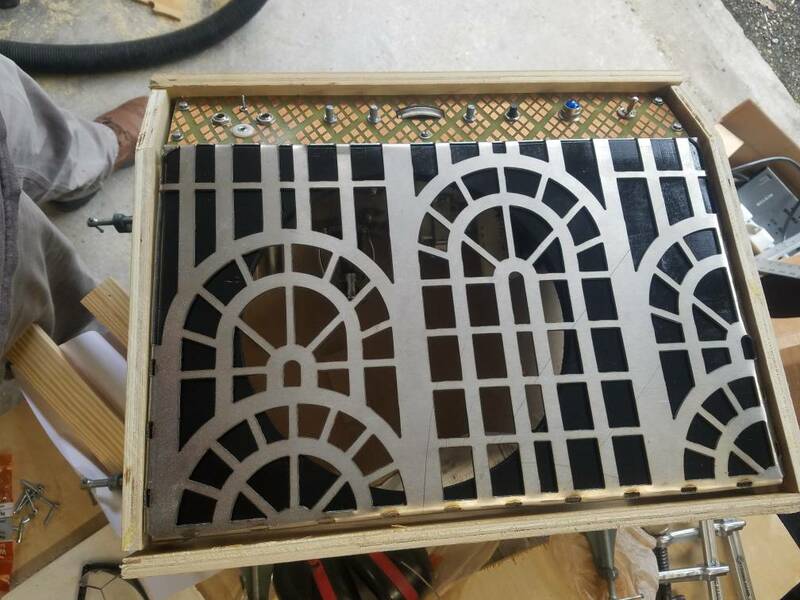 Carl dreamed up a metal grille for the speaker based on a carpet pattern, and I got it plasma cut. Lots of quality time fettling the (temporary) front panel to fit the various jacks, pots, meter, etc. Amazon shipped my 1/8" PCB stock via USPS. Somebody (who has to remain nameless since I don't know who) marked the dratted thing as delivered, then held onto it for an extra week before finally delivering it. Still, we got to get stuff screwed in place. The front panel is fiddly... My fancy cloth covered wire is a bit big for the attenuator switch lugs. Here's post-etch, with some of the tape scraped off. Stuck on the chassis with a couple of 6-32 -HEX- screws. Yes, they make them! Excellent! I build Hi-Fi stuff myself but I have built a 1W flea amp for guitar as well. In fact I have one tube amp project waiting for a few small final touches. 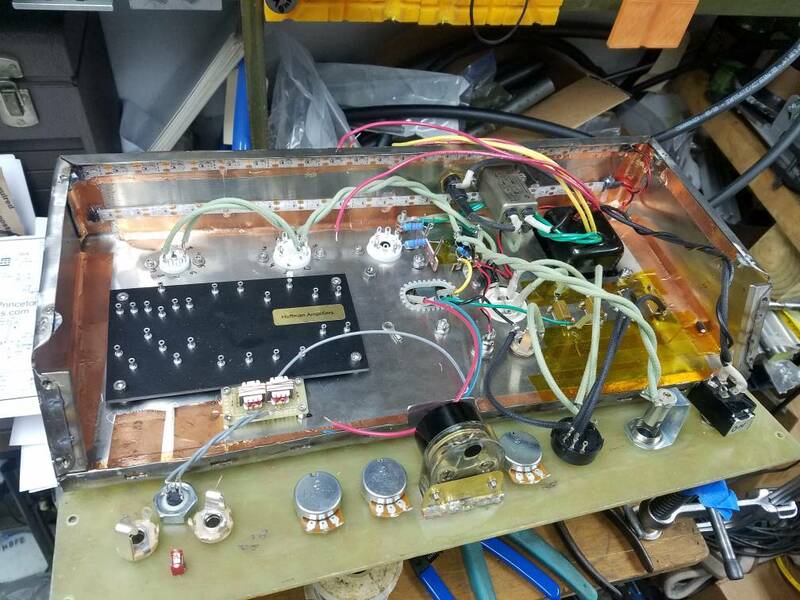 I have a few pictures of my amp builds on my website. In case you haven't already, check out Uncle Doug on Youtube. He specializes on tube guitar amps. Mr. Carlson's lab is another great resource, and of course the DIY Audio forum tubes/valves section. 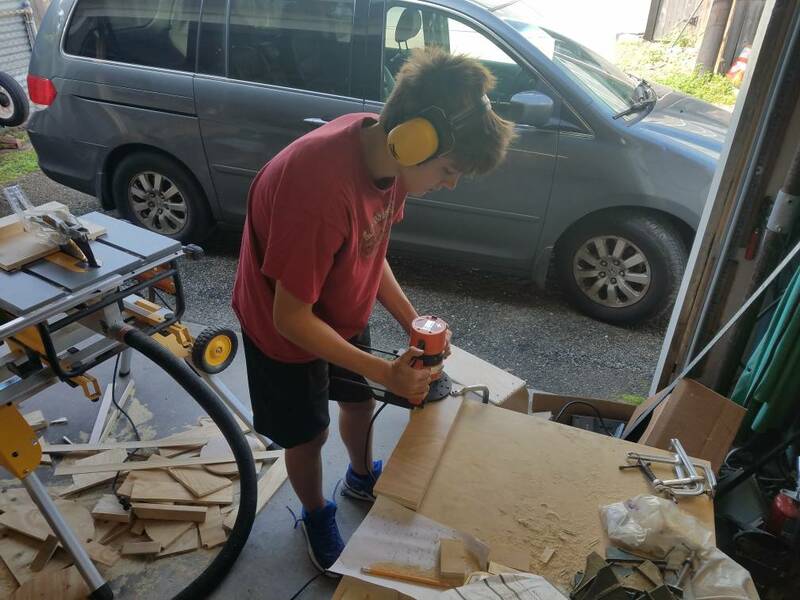 I like that you are doing a project with your son. I have rebuilt a few OLD tube amplifiers but I have never built one. I presume you use a solid state power supply and pair of tubes in the output - am I close? Push /pull on the Speaker? I don't have a clue how the new stuff works so I will watch with interest. Got the filament.wiring run, and the high voltage rectifier. The led backlight works now! Oooh I like this. I have been wanting to build a tube amplifier for a long time! Watching this one! Tube type electronics was my obsession for at least 20 years. Upstairs in my machine shop I have a 20 by 20 foot room stacked with stuff and a 20 by 20 foot deck up there holding some overflow..And my house is full.... I sold 75,000 tubes on ebay years ago just to get rid of them......However , despite all that and more , I never built anything , only repaired... Weldingrod, you do neat work and you don't know how much I respect that. I've finally got progress to report! We powered up and got glowing tubes! However... only the tiniest hint of sound. After running the ground wire to the front panel and knobs (d'oh), we got... not much of anything. More careful inspection and thinking. Measuring (what a thought). Wait, that 470 Ohm 5 Watt resistor should have actual voltage across it! Oops, I ran the red lead of the output transformer to ground, not high voltage. Ok, after fixing THAT, I powered up and was greeted by...wait for it... LOUD oscillation. Scream. More looking, poking, fiddling. Thinking. And, most crucially, surfing the web. I got a couple of ideas, and disconnected the feedback. The oscillation went away! Of course, all the sound went away too, so not totally optimal. But, it got me suspicious that the output transformer phasing might be backwards. Sure enough, swapping leads led to actual functionality! I do have to admit that the photo of a guitar plugged in is from when it wasn't really working... Gotta get Carl and the guitar back out to the shop. I'm still fiddling with the meter; Carl wants it to move when things are playing. It doesn't actually need to display anything useful or quantitative, just look cool! Thus, I hooked it across said power resistor. With some fiddling and capacitors, I got something that bounces nicely with the beat. However, when I bought the final parts and, um, added a couple of things... it didn't work. More fiddling. Progress! We cut cellulose composite material (plywood) yesterday, glued up, and routed. Carl has been filling and sanding while I girl scouted (I'm the troop leader, many dimensions of weird). It's just a test fit, still needs grill cloth and Tollex. Almost done! Sunday was "learn to Tollex" day! I'm frankly amazed at how well and easily it went, especially after reading the instructions that said "and don't start with fancy snakeskin; you want black!" Many hours of gluing later... Lots of fiddly cuts and masking where the contact cement gets painted. Another skill to add to the set. Water based contact cement is pretty cool stuff! And a beauty shot! There's a bar behind the grill and grill cloth that has an LED strip shining on the cone. Yes, the control panel is glowing too. The meter jumps around nicely when he's playing too. I am, as they say in Britain, chuffed! And I actually got some smiles out of my teenager! That’s a great build! Thanks for sharing.